Milk thistle extract has long been valued for its role in ensuring healthy liver function. 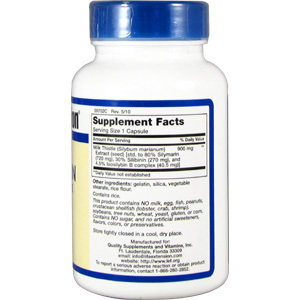 * Milk thistle extract consists of silibinin and other similar compounds. Until recently, researchers believed that silibinin was the most biologically active ingredient found in milk thistle extract. Highly advanced extraction technology has now enabled scientists to isolate silymarin constituents and to test their efficacy against various cell lines. Among the compounds tested, a silymarin constituent called isosilybin B proved to be the most efficient in maintaining healthy cell division. 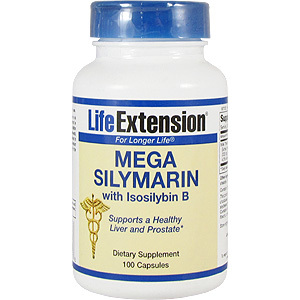 New Mega Silymarin with Isosilybin B is the first milk thistle extract to contain standardized, pharmaceutical grade potencies of silymarin, silibinin and isosilybin B - providing the full spectrum of milk thistle's liver and prostate protective compounds. 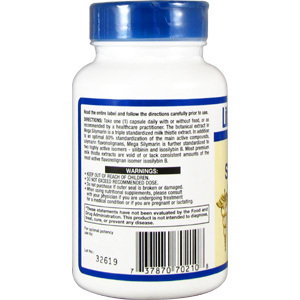 The botanical extract in Mega Silymarin is a triple standardized milk thistle extract. In addition to an optimal 80% standardization of the main active compounds, silymarin flavonolignans, Mega Silymarin is further standardized to two highly active isomers - silibinin and isosilybin B. Most premium milk thistle extracts are void of or lack consistent amounts of the most active flavonolignan isomer isosilybin B.
other ingredients: rice flour, silica, magnesium stearate, gelatin. 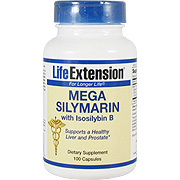 Silymarin Mega 900 mg - is shipped in a discrete, unmarked package. Orders are processed immediately and usually take about 3 to 5 working days to be received. We do ask that you try it for 2 to 3 weeks to feel the full effects. Any information received is used only for order processing and shipping purposes. Your information, such as e-mail address, will never be disclosed to a third party.